Tahuya is a small, unincorporated community in Mason County overlooking the "Great Bend" in the Hood Canal. The Hood Canal area of the Kitsap Peninsula is well known for its array of recreational activities nearly year-round, including camping, boating, swimming, watersports, and oysters/clamming. The nearby Belfair State Park also offers camping, hiking, wildlife exploration, windsurfing, and fishing. 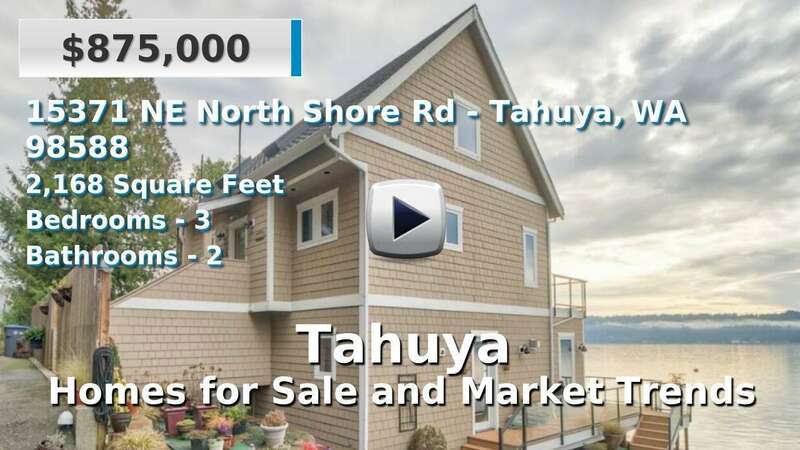 Homes for sale in Tahuya are generally older, but most offer waterfront, acreage or both. The community is just 15 miles south of Belfair; other nearby communities include Allyn-Grapeview and Port Orchard. 3 Beds | 1.75 Baths | 1252 sq. Ft.
2 Beds | 2.25 Baths | 1918 sq. Ft.
3 Beds | 2.25 Baths | 2320 sq. Ft.
3 Beds | 2.5 Baths | 2735 sq. Ft.
5.1 acres located close to the ORV trails and other recreational opportunities. Bring your dream home plans and build your own country retreat! 2 Beds | 1 Baths | 1232 sq. Ft.
3 Beds | 1599 sq. Ft.
100' RECREATIONAL WATERFRONT ON HOOD CANALS NORTH SHORE- 1.18 Acres - Great for clams and oyster gathering - Includes tidelands - Parking along road. 3 Beds | 2 Baths | 2168 sq. Ft.